TreeHouses: Look Who’s Living In The Trees! 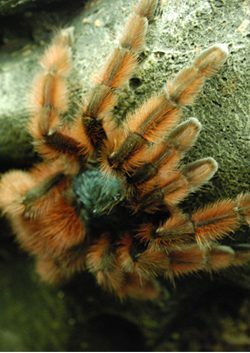 The Antilles pinktoe tarantula, Avicularia versicolor, is native to the Caribbean islands of Martinique and Guadeloupe. These arboreal (tree-dwelling) spiders construct elaborate funnel shaped webs, like the one you see here. This is where they spend most of their time. These large spiders are popular as pets because of their calm disposition and beautiful coloration. The name “pinktoe” was given to this species because the pads of their feet are pink. The Houston Museum of Natural Science is a 501(c)(3) nonprofit organization that receives no federal or state funding. Tax ID # 74-1036131.